This Balustrade Table features a gorgeous, carved center pedestal with stunning acanthus details just below the table's top. The edges flaunt a classic egg and dart motif. Though round, this table is far from casual. 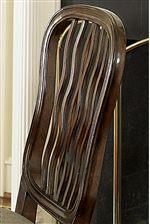 Exquisite in style but functionally comfortable, this distinguished table is anything but ordinary. 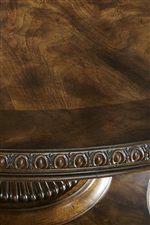 The Biltmore Balustrade Table with Egg and Dart Motif by Fine Furniture Design at Alison Craig Home Furnishings in the Naples, Fort Myers, Pelican Bay, Pine Ridge, Bonita Spring, Golden Gate, Estero, Cape Coral, Marco Island, Sanibel/Captiva Island, Point Charlotte, Ave Maria, Florida area. Product availability may vary. Contact us for the most current availability on this product. 1344-810 Balustrade Table Base 1 30"
1344-811 Balustrade Table Top 1 60" 60"